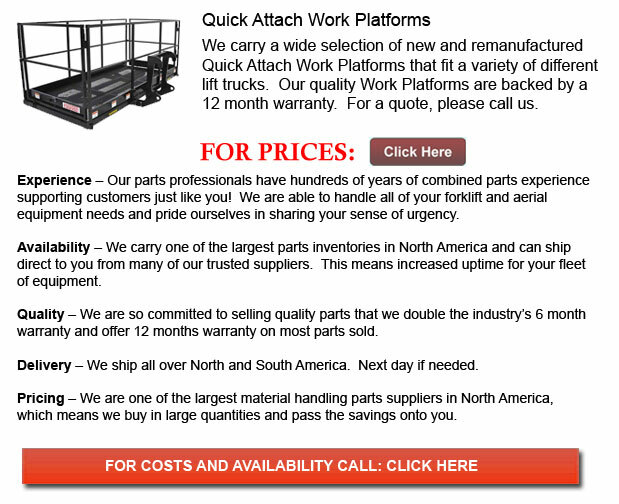 Quick Attach Work Platforms - Multipurpose lift truck work platforms attach quickly and safely to the lift truck through inserting tines into tine pockets and chaining platform to the forklift. These enhancements are usually utilized in order to safely and efficiently move maintenance staff. The fork lock or tine needs to be engaged in order to secure the platform to the tines rightly. This particular attachment includes a checker floor plate platform as well as a long strap together with hook to be able to safely attach the platform to the tine truck. These work platforms are constructed of welded steel and powder coated utilizing a blue finish. They have a lifting capacity of 1000 lbs. Copyright © 2010-2019 forkliftpartsnorthdakota.com All Rights Reserved.